Notes: The CDC dun utilizes CDC material for the wing. 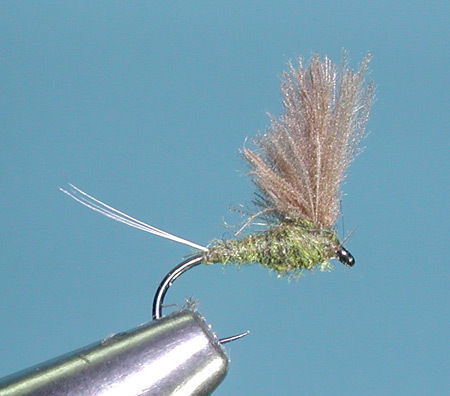 It can be tied in a comparadun style without a hackle due to the high floatation character of CDC. This is a progression of the No-Hackle pattern that was introduced by Swisher and Richards in the 1970's. The CDC can also be used as a wingpost with a parachute hackle surrounding the post. 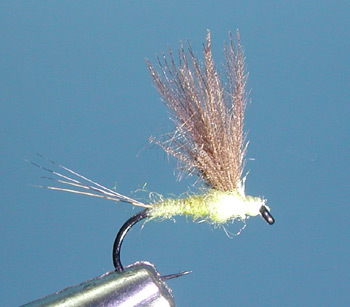 The hackle provides a somewhat higher profile and will withstand faster currents. 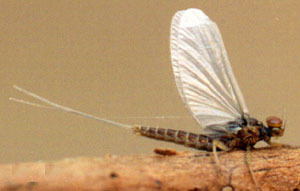 It can be tied in a number of sizes and colors to mimic the newly emerged mayfly. The pattern is generally simple with a tail of microfibbets or Tailing fibers. The body can be tied with dubbing or quill, maintaining a slender, thin body. The CDC wing is located above the thorax position and can be tied using a number of techniques. 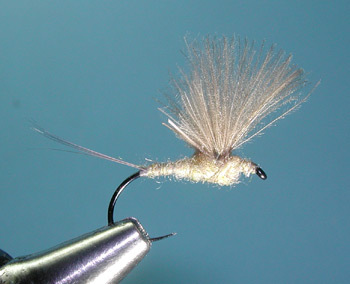 The simplest technique is to tie two CDC plumes with the tips facing over the eye of the hook, pulling the plumes until the tips equal the length of the shank, and to trim the back half of the CDC with a taper. Another technique is to trim the fibers off two CDC Plumes and anchor these fibers to the thorax region, pulling the fibers for desired length. Two plume tips are secured in front of these fibers and secured upright for wings.